Although there are various techniques used to train dogs, the basics of any training regime are consistency and plenty of exercise. Discipline and affection are also key to a well-trained dog. Dogs need a leader - they feel more confident with a leader. If their owner is not the leader, they will take the role instead of their owner or anyone else. No matter what training methods you implement, without consistency, your dog will be confused. 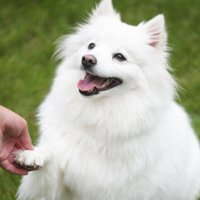 Consistency should include the whole family and any friends whom your dog regularly encounters. Dogs tend to follow precedent, if you allow your dog to jump up on a passerby, then your dog will try to jump up on other people too. Make sure the whole family understands and follows the rules with your dog, or else your dog will learn when and with whom it can misbehave. Children are at a greater risk for injury because dogs learn quickly that they don't have to follow the rules with them. Kids should learn the dog's obedience commands, and with an adult's supervision, the dog should learn that they have to obey children, too. To establish more leadership in the dog's mind, family members should eat before feeding the pets. In the dog's world, who ever eats first is dominant. Another great way to establish dominance and leadership is exercise. As many dog trainers say, "a tired dog is a good dog," so regular exercise is a must.There is no better way to demonstrate you're the leader than by walking your dog. Walking your dog when it is tired makes it much easier to keep your dog from pulling you. Your dog should walk next to you calmly with a loose leash; walking incorrectly will reinforce to your dog that it is in fact the leader. If your dog pulls at the leash, wanders, zig-zags, or stops to relieve or mark, it is the one making the decisions and this reinforces the fact the dog is the leader. Affection and rewards are good, but too many people only give praise and treats without discipline. Make sure you are not sending mixed signals, do not give your dog any positive attention while it is misbehaving. For example, when a dog whines, some people think they should reassure it, by stroking it and saying it is okay. Not only is this telling the dog that it is okay to whine, but it also tells the dog that when it whines, it will get praise and attention. This is where people have to pay close attention to the signals they are sending to their dogs, because miscommunication is always a possibility and difficult to correct. Another common mistake is repeating obedience commands to your dog. If you tell your dog to "Sit" and it does not do so, repeating the command "Sit" multiple times encourages the dog to ignore you more. The best training technique is to tell your dog to "Sit", and if it does praise it. If it does not sit, make it sit by pulling up gently on the leash and pushing down with your hand on their pelvis. Dogs start to ignore commands when people repeat commands and don't follow through. A command should be said once and then you should follow through with making your dog do what you asked. Remember, in any method of dog training, consistency and exercise are key to training an obedient dog. The dog will be happier and will be a wonderful family member.